One collection compiled on ATS's website against competitor Xerox Corporation (formerly ACS) references 36 mainstream news reports regarding the numerous problems with Baltimore City's speed camera program, including discoveries that the cameras had issued erroneous citations to large numbers of innocent motorists. Many of the articles are from the Baltimore Sun's extensive coverage of the issues. Reports from WBAL, the Washington Times, Capitol Gazette, WYPR, and Patch are also included. Xerox Corp's contract with Baltimore city was terminated at the end of last year, but problems continued with the program under the new contract with Brekford Corp including an additional case where hundreds of erroneous citations in early 2013, resulting in the temporary shut down of the city's speed and red light camera system. 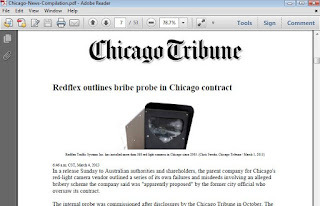 A second collection compiled against competitor Redflex includes 21 mainstream press reports covering that company's role in a $2million bribery scandal in the city of Chicago. Redflex was barred from re-competing for the city's contract over the issue. The file contains 21 mainstream news articles from the Chicago Tribune, FOX, the Daily Herald, the Chicago Business Journal, and other sources. The files appear to be designed to help ATS gain advantage over their competitors in contract bids. Most of the articles in the files are contained in their entirety, creating a 'ready to deliver' package which could be provided any state or local government which is considering speed cameras. If you won't take our word for it when we say photo enforcement is corrupt scam, then take the word of a speed camera company.